In this day and age, getting discovered as an artist is both easier and more difficult than ever. On the one hand, social media gets your work out there. On the other? The competition is steep. Artist Brian Cook said it best: “Nowadays it is SOOO much easier and creatives have way more control. However, that also means there is a LOT of competition. So the tricky part now is standing out in a sea of other artists.” How DO you stand out in that vast creative sea? Threadless has been a go-to place for rising artists to get their work seen, like Mathiole, Steven Rhodes, Cody Weiler, and many more. Here are a few tips on how to stand out and how to get discovered on Threadless. There are forums for every topic! 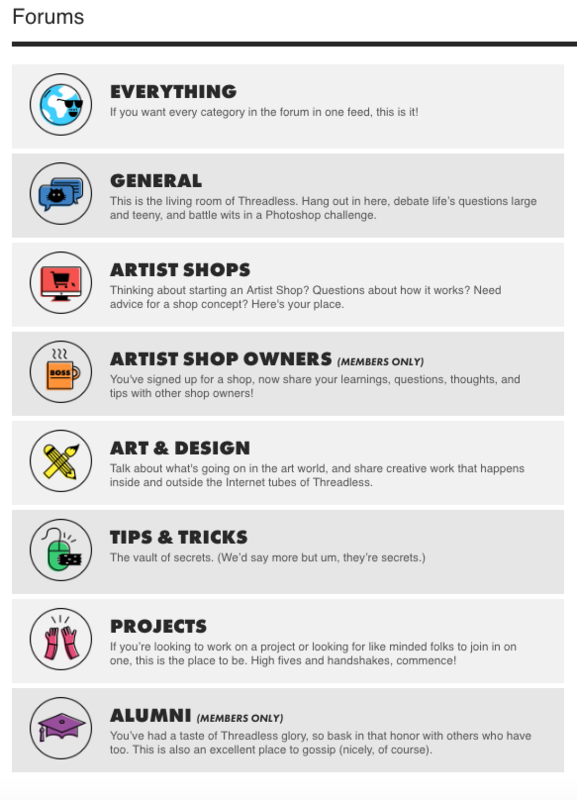 The Threadforums are an amazing place to find advice (from artists and staff alike), to get feedback on your art or Artist Shop, to find out how to get discovered on Threadless (#meta), or just to meet other artists and talk about the latest memes. It’s a social way to put your name and voice out there. 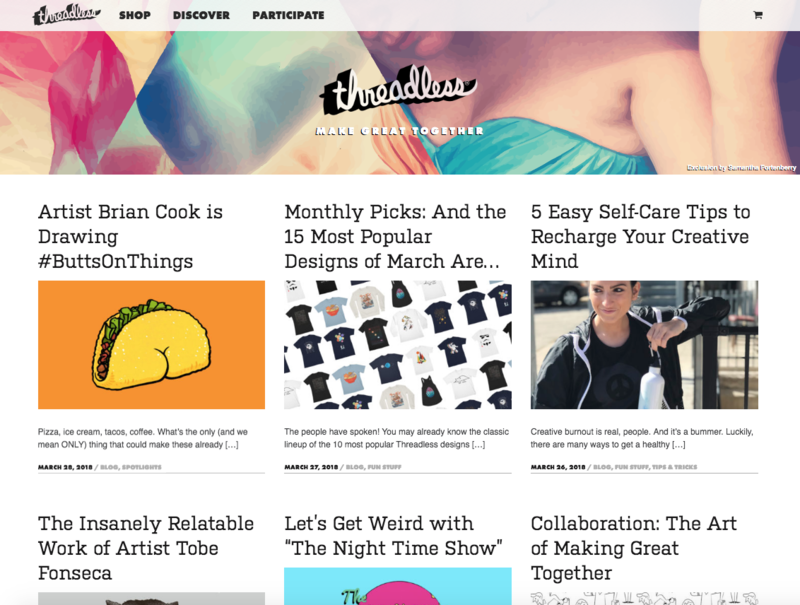 The Threadless blog is a great place to test out the contributor waters! Did you know that the Threadless blog takes contributors? In fact, we LOVE contributors! One way to build your audience is to write guest posts on blogs with large audiences. And ours is a great place to get experience pitching & writing fun articles. We’ll give you feedback on whether or not a post fits our style and can give you concept tips. 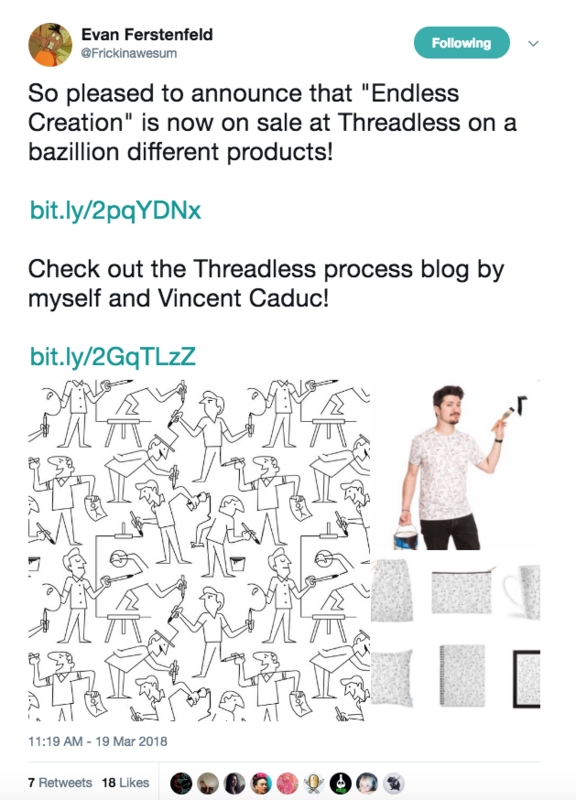 Threadless tweets out blog posts to our 2M+ followers, so your efforts get some seriously solid exposure. And at the very least? People often celebrate Threadless blogs in the comments – our community is like a built-in support system. We’ll save you the obvious “Ice Ice, Baby” reference here. When it comes to figuring out how to get discovered on Threadless, sometimes it helps to team up with other artists. If you have a good idea but you’re not exactly sure how to pull it off, try reaching out (perhaps, say, in the forums) to other artists and collaborating on a piece! Ross Matlock of the Slogan Tees Artist Shop collaborates with other artists regularly to bring his slogan tees to life. And artist Perry Beane has done many collabs to create amazing combined works. I know, I know – “Share on social” is something you’ve heard a million times. But social media is one of the main ways we can find and share your work! When you get printed at Threadless, when someone takes an awesome photo rockin’ your design, when your design is featured on The Flash (hey, it happens), celebrate it on social for the world to see. Use #Threadless and #ArtistShops so that we can find your tweet, IG post, etc. We might even push it through our own social channels! Consistently add fresh designs to your Artist Shop so that you’re appearing regularly near the top of the “New” section of Discover. The Discover section of Threadless is getting quite a bit of traffic and is definitely a key resource to take advantage of. Back in the day, to be on Threadless you had to win a challenge or have your design voted in. While this is still held in high regard (and we definitely encourage you to submit your work or try out a Challenge), now you can get discovered on Threadless using your Artist Shop. If your Shop is powered by Threadless, your newest designs and designs that lots of people are checking out will appear in the “New” or “Trending” sections (respectively) of the Discover feed. Plus, with the hi-5 feature where people can give your designs a little hi-5 (it’s basically the Instagram ‘like’ of Discover), you’ll want to add new designs from time to time. After all, the more hi-5s, the more appealing your designs look! Have you added tags to your Artist Shop designs? Adding relevant keyword tags to each of your designs makes it way easier for people searching for art just like yours to actually find your work. If your design is a cat astronaut in space, for example, a few relevant tags could be as follows: cat, astronaut, space, stars, planets, cat design – you get the idea! If you want to add tags to your current designs, go to “Manage Your Products” in your Dashboard, click “Edit Design” by the product you’d like to add tags to, and you’ll see a little section that says “Add Tags”. Get tagging! 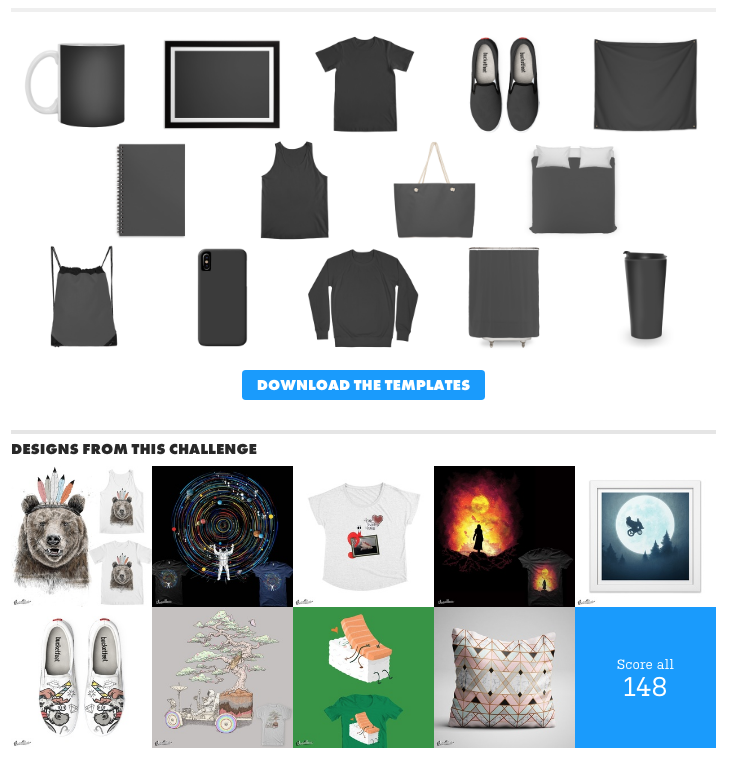 Templates to test your designs out on and a few submissions up for scoring in the always-open Threadless challenge. You might have the next most popular Threadless design of all time. But if it’s sitting on your desk, it’s never going to get discovered. Submitting your work to Threadless not only gives you a chance at getting printed – it also means that voters and fellow artists in the community perusing potential new designs can see your work. And sometimes, if you don’t win a design challenge but we really dig your design, we’ll print it on its own! And hey, let’s say you submit to Threadless and don’t get chosen. Then you’re putting yourself in the position to get some constructive feedback. It’s not always easy, but it’s a great way to improve your skills! If you don’t have an About Page filled out for your Artist Shop, you’re missing a huge opportunity to connect people to your social media, website, and more. Your About Page is the hub that connects fans of your art to your social media, personal website, and to YOU as a human person behind the art! Fill out your About Page – let people know a little bit about yourself and your work (which also, by the way, is great for SEO) and absolutely connect your social links to your Shop. Here are a few tips! Indeed great information shared here! It is a awesome idea and how to discovered threadless. I have to say you guys are killing it with the artist shops. I’ve spent a long time researching other online venues to start selling my own designs through and this is by far the best. There’s a few things I wish were there but all in all its pretty stellar. Now, this is some useful info. I really liked that you’re inviting contributors to write guest posts. Will definitely write some. great info! I just signed up.